During the 2nd international JTET conference in 2004 the participants of the European Network of the UNESCO/UNITWIN project “Reorientation of Teacher Education to Address Sustainability” met for the second time, shared their ideas about the further development of the project and set the tasks for the future. The idea about the next Conference in Vechta was proposed and the first arrangements for the Conference were made. 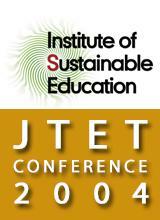 The 2nd international JTET conference “Sustainable Development. Culture. Education” introduced the fourth volume of JTET and for the first time the audience was able to observe the detailed report about the main aspects of JTET from the viewpoint of its past, present and future.